In the summer of 2014, Andrey Stepanyuk, back then still director of Domodedovo Business Aviation Center (DBAC), shared with Russian Aviation Insider the company’s massive refurbishment plans for the center’s infrastructure, including the construction of a new passenger terminal and hangar facilities. The investment in the project would exceed 350 million rubles back then ($6 million at the current exchange rate). “Creating a competitive playing field for service providers (handlers and catering companies), coupled with further development of services, will allow for boosting the center’s traffic by at least 30%,” Stepanyuk said at the time. Now the management plans to start reconstruction activities in the second half of 2018, after the June-July FIFA World Cup, which is not expected to cause any excessive surge in the number of operations at the FBO. It is apparently too early to speculate about the projected 30% increase in traffic through DBAC. As Yatsuk himself stated at last year’s MAKS exhibition, from July 2015 to July 2017 Domodedovo’s share in the total number of foreign operators’ flights to Russia stood at just 4%. At the same time, Vnukovo handled 47% of flights, and Sheremetyevo and Pulkovo processed 11% each. In Moscow alone, Domodedovo’s share was still quite modest at 6%, whereas the bulk (74%) was handled by Vnukovo and the remaining 18% by Sheremetyevo. The CEO admits he wishes for the volumes to grow, adding he believes the prerequisites are there. For one, access to the airport has become more convenient with a newly built highway. As you arrive at Domodedovo’s FBO you can’t miss the passenger terminal, whose shape resembles an airplane. However, the interior appears fairly modest, given that the target customer base are wealthy passengers and business jet owners. Apart from the terminal, DBAC manages three hangars and aprons with parking stands for 10 to 15 aircraft depending on their size, as well as two helipads. According to Yatsuk, there is enough capacity for DBAC’s current traffic. Whenever necessary, the center’s customers are free to use free stands at Domodedovo under an agreement between the airport and the FBO. On the other hand, Yatsuk admits, the existing terminal does not completely satisfy the requirements of some of the customers. This, however, is offset by the privacy and efficiency of the service, and by the considerate staff. As a matter of fact, according to the federal register of businesses, DBAC’s managing company Business Aviation Center shares one of its founders with Jetport, which is run by Igor Mudrik, a senior executive at Vipport. The latter company operates a VIP passenger terminal at Vnukovo 3. Seeing how Vnukovo 3 has been developing aggressively of late, Russian Aviation Insider inquired Vipport regarding its interest in the development of the FBO at Domodedovo but received no reply. 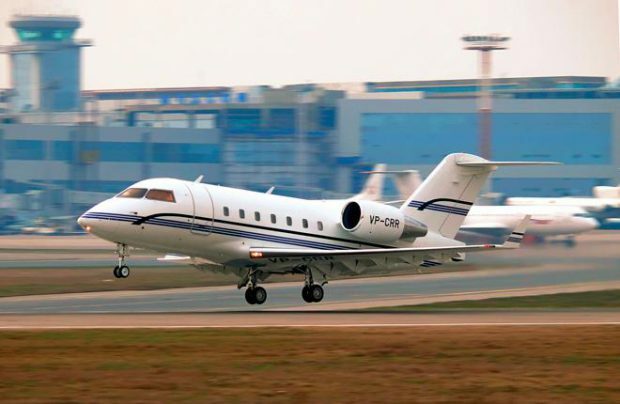 The negative factors which led to a radical shrinking of the Russian commercial aviation market (the economic downturn and political sanctions) inevitably affected business aviation as well. Yatsuk reveals that some of DBAC’s customers have traded their Citation-cass jets for business class travel with scheduled carriers, because even small business jets have grown unviable. The bizav industry in general took a blow and lost about 25-30% in the period between 2015 and 2017. According to Yatsuk’s assessment, it is too early to predict when the segment will return to normal. Development of Russian business aviation has been impeded not only by political and economic issues but also by internal tensions. DBAC representatives point out that administrative barriers, high import taxes, and theh complicated process of obtaining GA operator certificates are all affecting the industry. These issues are not insurmounttable, but they lead to higher overhead costs and are extremely time cosuming. All of this can be done faster and less expensibvely outside Russia, which means that the bulk of business aviation users prefer to base their aircraft with foreign operators. It appears advisable for the industry to study international practices and streamline its procedures, removing unnecessary barriers and unreasonable requirements in order to make the Russian registry as attractive as those of the Bermudas or the Isle of Man. The rising costs of business jet handling and maintenance has led to foul play on the business aviation market. In the recent years, many companies have encountered instances of fraud on the part of so-called auditors, who reduced their “inspections” to attemts to steal customers. Such actions have a negative effect on the industry in general, Yatsuk says. He hopes that in the future the market structure will change, and that business terminals will be differentiated by the types of aircraft they serve. In particular, Yatsuk predicts DBAC’s potential focus on lighter and medium-sized airplanes, which would allow the company to maintain the prices and efficiency at an optimal level.